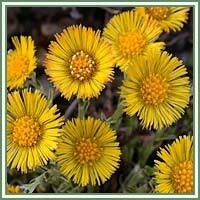 Habitat: Coltsfoot is native to Europe, North Africa and parts of Asia. It can be found on dump soils and disturbed areas, on roadsides and highways. Description: Coltsfoot is a perennial, herbaceous plant, growing up to 30 centimeters in height. It spreads from a branched rhizome. Leaves appear after the flowers; they are deep-green, lobed, heart-shaped and irregularly toothed along the margins. Bright yellow flowers, very similar to dandelions, appear in early spring. Medicinal use: Coltsfoot had long been used medicinally, mainly as antitussive in treatment of coughs and other respiratory problems. Leaves and flowers are generally used in form of a decoction for various chest conditions. It has proven to be very helpful in treatment of spasmodic coughs. It can also be used in case of asthma, diarrhea, slow metabolism, as a blood purifier and a diuretic. 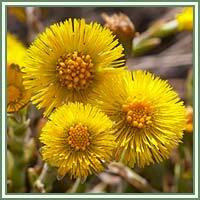 Applied externally, Coltsfoot is beneficial in treatment of sores, injuries, rashes and painful joints.